Looking to create more DIY projects out of plywood but can’t afford the power to tools to do it? We get it. That’s the reason this post exists. Hand cutting plywood can become a pain. Dealing with bonded layers of wood and adhesives is what makes cutting plywood especially unique and difficult. The fact is, as a DIYer, you will run into the task of cutting plywood at one point or another. Let’s dive into some budget-friendly options for great saws you can use to tackle the task with ease and without breaking the bank. Plywood is a choice of wood many DIYer’s choose to use purely because it works for so many different applications and doesn’t cost much to purchase. Plywood comes in interior and exterior grades and can save you substantial money compared to other options such as Cedar and other premium wood grades. Working with plywood doesn’t come without its issues. It’s bonded with 3+ layers. This adds to the challenge. In addition, the opposing grains can make it difficult to cut straight and accurate lines often leaving rough edges, splintering or chipping. At the end of the day, these are purely just recommendations. Ultimately, you need to make the decision on what saws work best for the project you are currently trying to tackle. This quick guide is designed to help and at a bare minimum, steer you down the correct path. Especially for the beginners. With that in mind, I wanted to go over the best handsaws for cutting plywood. Not everyone has the budget for power tools. In addition, some old school DIYers just simply prefer doing these task by hand. For the sake of this post, we are going to cover the best handsaws you can use for cutting plywood as well as some alternatives you can use to get the job done. Before going any deeper it’s important to remember a few pointers about hand saws and plywood. First and most importantly, you need to have a sharp reliable blade. In addition, hand saws are created specifically to perform different functions, cuts, and angles. Of course, always keep safety in mind as well. It’s important to analyze your project and determine what kind of cuts will be involved as well as the kind of wood you will be working with. These are the basic rules but as far as the meat and potatoes, here is a list of the best handsaws you can use for plywood. All these saws can excel in one area, but may you leave you frustrated in others. Obviously, it’s beneficial to have all the handsaws at your disposal. Especially if you work with wood often. However, we know that doesn’t always work out or logically make sense for your budget. Long story, short. Find a saw that aligns with what you are trying to accomplish. Below, we will begin diving into each of the handsaws we recommended. In addition, we want to cover the specific cutting needs they fulfill and give recommendations on where you find and or purchase this saw. Japanese saws cut on the pull stroke. The only downfall that presents itself when using a Japanese saw is the possibility of running into a saw jam. This can be especially true if you are working very deep into the wood or attempt to saw too quickly. Outside of that, the Japanese saw can be great for cutting plywood. It can be easily controlled and they often come with double-sided options for cutting. The reversible blade is excellent for cutting patterns. Your Japanese saw can also double an excellent pruning saw. It’s especially great for cutting curves and planks in the plywood without damaging the edges of the plywood. With some practice, it’s possible to cut very clean lines with clean edges. It may take a little extra effort but hey, doing anything by hand always does. Japanese saws often come with double-edged blades. It usually has a rip cut side and cross-cut side. It’s basically like getting two saws in one. Just remember on a Japanese saw that the bigger teeth are always the ripping teeth and typically pointed in the opposite direction compared to your pull teeth. Japanese saws can also be used great for flush cutting dowels. This is because the Japanese saw can easily sit flush on the wood to get a nice trim flush cut. This version of this Japanese saw is going to be best for fine cuts and dove cuts. You want to use this option when you don’t want to take too much material off the wood. No need to look much further for the best Japanese Saw money can buy. Well at least for the right price. The SUIZAN Japanese Saw (Ryoba) Double-Edge is our top pick. Especially for woodworking and or plywood jobs. This specific saw although sold on Amazon (link to Amazon) is manufactured in Japan and SUIZAN. SUIZAN has been in the tool making business for well over 100 years. Some of the reviews boast the durability and clean cuts and others rave about the high-quality blades included. Overall, you can’t go wrong with this option. This is another great option for an economical saw. It’s made of iron, it’s lightweight and it’s priced low enough for just about anyone to afford without issue. It will work just like the Japanese saw listed above except it will be a single sided blade. It’s been known based on reviews to cut through boards up to 2 inches thick without issue. It comes with a quality blade that most users boast about the razor-sharp tips. It also has received excellent reviews for cutting projects such as cutting dowels. Overall a choice you can’t go wrong with. You can find it on Amazon typically for under 20.00. Here’s a brief video giving more detail that’s pretty useful. A coping saw is very similar to a jigsaw when it comes to cutting small precise and intricate pieces. A coping saw can also serve as a great budget-friendly alternative to a Japanese saw to accomplish various DIY projects with ease. Your blades on the coping saw are like a hand powered jigsaw that can perform cuts in a push and pull fashion. You also can rotate the blade to fit into those tight corners and small tight cutting jobs. Coping saws are used to external shapes and interior cutouts. Ensuring you have a coping saw with a high teeth count will go a long way in proving these are great saws for plywood up to ¼ thick. Coping saws are going to perform best on plywood when they are being used for the cutouts and external shaping we mentioned previously. This biggest downfall you may encounter with a coping saw is the ability to keep the blade tight and the tendency individuals have to force the blade. You can easily counter this by allowing the blade to do the work. A final tip for using coping saws is to always keep the blade perpendicular to the cutting surface which will ultimately keep your cut more uniform. Any coping saw would be great for woodworking projects. Here’s an example of some of our woodcraft patterns that coping saws would work great for. For a more in-depth look at using the cope saw, you can also check out this video on UNIQUE tips and tricks of how to use a coping saw effectively. Special Note* If you plan on cutting primarily straight lines, a basic regular fine-tooth saw could be a better alternative. Our top pick for a recommended coping saw came down to a few choices but ultimately, we decided your best option is the Olson Saw SF63510. It sits at about 4.5/5 stars from reviews, it is under 20.00 bucks and comes with a nice starter blade. From a few reviews including ours, it’s been stated to be “the best coping saw” on the market. This is due to be able to purchase it for under 20.00 bucks. This made it a no brainer for us to rank it #1 on our list for coping saws. The tenon saw is slowly becoming a bit outdated by the Japanese pull saw mainly because you can accomplish the same task with less effort with the Japanese saw. However, tenon saws for someone who knows how to use them properly can still be great saws to make cuts accurately and with efficiency. Tenon saws are most frequently used to cut tenons for mortise and tenon joints. They are excellent for cutting joinery fine woodworking and excellent for making cuts across the grain. Tenon saws have a stiff grip on the edge opposite of the cutting edge. This allows for great control and precision during the cutting process. Tenon saws have about 10-14 teeth per inch. This is higher than most saws. It does slow things down a bit during the cut but creates a great clean cut and nice-looking finish. The large pistol grip handle is designed to help protect your hand when sawing. The best way to use a tenon saw is to grip just like a pistol. Mark your start and end points on your wood. Begin by using your thumb as a guide next to the blade just to get the cut started. Once you have sawing groove started, you can move your thumb out of harm’s way and continue sawing with long even strokes until you have reached your ending line. We like the Lynx 12” Tenon Saw Crosscut. You can find it on Amazon. It runs a cross-cut style teeth arrangement with 15 teeth per inch. The teeth are cut to ensure the best cut. It’s only received positive reviews from other users including us. Overall, a great pick if you need a budget-friendly tenon saw. A crosscut saw that is designed primarily for cutting wood across the grain. They come in a variety of sizes. In addition, crosscut saws are going to have small teeth closely grouped together. A key to remember when using a crosscut saw is to not apply overly heavy pressure. Not applying to much pressure will avoid splintering the opposite side of the plywood. Your crosscut saw has knife-like points in the teeth on the blade and typically works best at about a 30-degree angle when you are cutting for optimal performance. In addition, the sharper saw the better when using a crosscut saw for plywood. The Carpentry Pull Grip Wood Crosscut Hand Saw is a top pick if you ask us. It’s cheap, comes with a 12-inch blade and in addition, comes with a replacement blade. You can find it on Amazon. It features a push-button release to easily change the blade and has received only positive reviews. Keyhole saws offer a large variety of different shaped blades and handles. They most commonly use wooden or plastic handles. This can do be a great saw for you tight projects or projects with limited space to work with. You have the option of using either a fixed blade or a more compact retractable blade for portability. Overall, they are fantastic for internal cuts and tight spaces. Keyhole saws are known to be a bit flimsy so it’s important not to apply to much force when using. The 6-inch Jab Saw from Level 5 is our top pick for a reliable budget friendly keyhole saw. It comes with a slim profile, sharpened tip and a large handle guard with a soft grip handle. It’s typically easy to find a stellar deal on Amazon. A rip saw is like a crosscut saw. With a rip saw, your teeth are going to be pointing to the left. A rip saw also contains flat top teeth as opposed to the cross-cut teeth are beveled to create a knifepoint. A rip saw is very similar to having a bunch of chisels. This is different than a cross-cut saw which is more like cutting with a bunch of knives. The knives points on a crosscut saw are going to be great for cutting fibers between the wood. When using a rip saw, you are cutting at a perfect 90-degree angle and cutting in line or always on the same plane. The Crown 190- 24 Inch Rip Saw makes our Best Saws For Plywood list due to overall price and quality. We also love that this saw features 4.5 teeth per inch and is constructed of nickel-chrome alloy steel. It’s manufactured in Sheffeld England. You will find that these blades are easily sharpened. Most of the reviews rave about the quality of the saw you get in return for the low price. You can find it on Amazon typically for under a hundred bucks. Now that we know some of the best saws and the specific uses for them, let’s take a quick look at how we came up with this list and why we recommend some saws over others. What Do We Consider When Choosing the Best Saws? 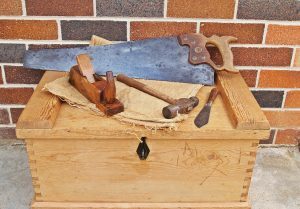 We like to look at several different factors before placing our approval on what we consider the best options for hand saws or recommending them to anyone. It’s important to make considerations about the specific project you are working on but in addition to that, here are some factors to keep in mind before making a final decision on which saw to purchase. We all know that price is driving factor behind any purchase. We like to shoot for quality first and then worry about the price but overall, price does matter. Keeping the saw in a budget-friendly zone for the quality it gives in return, is a big ranking factor we consider. It doesn’t do anyone to any good to have a saw that starts giving us problems right after purchasing it, so durability is always a concern. We want to recommend the saws known to last with a solid foundation and positive reviews for doing such. Other individuals input on the best saw for various projects is also important to consider. We like looking at saws that have been boasting 4-star reviews across the board. People tend to be very honest with reviews because we have no reason not to be. Consistently achieving top reviews, makes us feel comfortable extending out the warm recommendation to all of our readers. Quality falls into the category of durability as well as price. It isn’t very helpful to buy a low-priced saw if you run into poor quality blades, with low-quality teeth or even handles. The quality and finish of the saw are important factors to consider before purchasing. Blade quality is perhaps the single most important factor to consider. It’s obvious the most integral piece of the saw. Having the ability to interchange blades is nice but not 100% necessary. What we do look forever, is saws that at least come standard with a solid well-reviewed blade without having the necessity of purchasing individually. We don’t necessarily consider this a deal breaker for our reviews but it is a nice added benefit to throw into a solid saw. Another important factor to consider is your actual skill level by using hand saws. Some of us aren’t familiar with best practices or even the different uses for saws. When you run into this situation, it’s not recommended to just purchase a saw based on your project without doing some homework. If you choose a great saw but aren’t familiar with its uses, you can still be left dealing with some frustration and a project not being finished up to sastifcation. Make sure to research a bit about the saws discussed above. Look for best practices or how-to-tutorials. Here are just 4 additional tips we recommend when trying to find the best saw and some additional tips for how to make great cuts with handsaws when working with plywood. If working on projects that require more detail, finish up the edges with a jack plane, new sharp blade, and a shallow setting. What Saws Do You Believe Are the Best for Your Woodworking Projects? We all have our favorite picks and tools we love to work with. Especially woodworkers. We tend to stick to what we know best. Finding the best saw is no different. What saws have you had great luck with using for your woodworking or what do you think is the best handsaw for plywood? Do you have any recommendations for best saws that didn’t make our list? If so, be sure to leave a comment below. Maybe depending on the recommendation, we will decide to add it update the list!